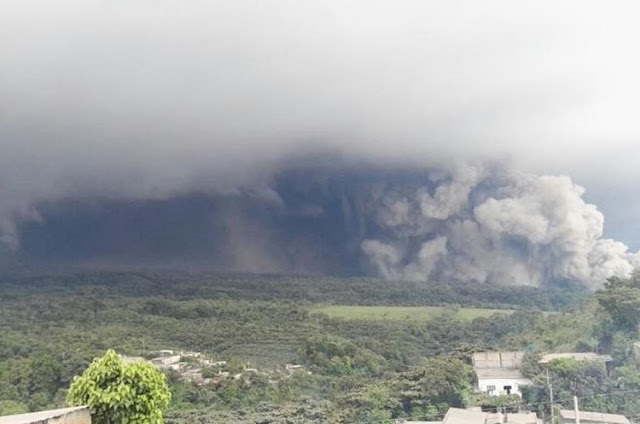 Guatemala's Fuego (Fire) volcano located about 50 kilometres (31 miles) from the capital, on Tuesday began erupting for the fourth time this year after in June it entered an eruptive phase during which at least 500 people died including 238 who disappeared without a trace. In a special bulletin, the Seismology, Vulcanology, Meteorology and Hydrology Institute said that weak and moderate explosions were occurring in the cone, producing a column of ash 4,800 meters (15,750 feet) high. In addition, over the crater, there have been two incandescent pulses rising up 300 meters. The fire mountain, rising 3,763 meters above sea level and located on the mutual border of Escuintla, Chimaltenango and Sacatepequez provinces, on June 3 produced one of the most powerful eruptions in recorded history. The eruptive phase that began on Tuesday, which has already resulted in a fine rain of ash falling onto the villages of Panimache, El Porvenir, Morelia, Santa Sofia, Sangre de Cristo and Pedro Yepocapa, is causing "weak and moderate" avalanches around the crater. The institute said that there are "lava flows 1,000 meters (long) heading in the direction of the Ceniza ravine" and weak rumbling and shockwaves are causing roofs and windows in structures in the area to rattle and vibrate. Because of the current activity, authorities are not ruling out that in the coming hours - or even minutes - there could be "new lava flows," although the possibility also exists for "pyroclastic flows in the direction of the main ravines," and authorities have asked the public not to approach the volcano. National Disaster Reduction Coordinator spokesman David de Leon said that National Route 14 has been closed as a precaution, but he added that some motorists "were not respecting" the measure and had threatened the authorities with "violent action, such as setting fire to their patrol cars, if they were not allowed to pass." "They drove through the sector without respecting the closure and (the fact that) the Fuego volcano's range of activity is increasing," he added. A stretch of the highway was completely buried during the June 3 eruption, which affected almost two million people, some of whom lost their homes and all their belongings.